The first call for proposals was closed on July 24th. Future calls will be announced on this page. Take the challenge, make the change! Innovations Against Poverty challenges the private sector to develop products, services and business models that can contribute to the fight against poverty and climate change. Through our advisory and non-reimbursable funding, we support innovative Inclusive Business models that deliver developmental benefits for the low income population in both rural and urban areas, while being commercially viable. IAP provides advisory support and non-reimbursable funding for up to 49% of the total investment to selected projects through competitive open calls for proposals. Private sector development has proven to be a real catalyst of change when it comes to creating the opportunity for low income people to lift themselves out of poverty. Additionally, low income markets represent a large business opportunity: the four billion people living on less than $8 USD a day constitute a global consumer market with a shared purchasing power valued at 5 trillion USD. The low income population provides the potential to increase labour, supplier and distribution channels that can support expanded production and market supply. This offers significant scope for entrepreneurship and private sector development to make a positive impact on low income people’s quality of life. By thinking innovatively, companies can develop business ideas that solve social and environmental issues while at the same time maximizing their competitiveness and profitability. However, many of these initiatives are exposed to commercial, technical and financial risks, and have limited access to markets. Most companies initiating an innovative Inclusive Business idea traditionally lack the technical support required and are too large for micro-finance, and too small and risky for mainstream commercial debt and venture capital, making them part of the so-called “Missing Middle” gap. In this context, the Swedish International Development Cooperation Agency (Sida) launched the Innovations Against Poverty Fund (IAP) to stimulate private sector development initiatives which otherwise would not have taken place. The IAP fund functions as a risk sharing mechanism, with the specific mandate to identify and support innovative Inclusive Business models that deliver both commercial benefits for the private sector and developmental benefits -such as the creation of jobs, income increase and access to basic goods and services- for low income people, prioritizing women and youth. Energy: including, but not limited to, access to affordable, reliable, sustainable and modern energy for all. Applications should be contributing to the realization of one or more of the Sustainable Development Goals (SDGs). IAP will provide non-reimbursable funding ranging from €50 000 up to €200 000 not exceeding a maximum of 49% of the total required investment to implement the innovative Inclusive Business idea. The advisory support offered by IAP will be provided through trainings and coaching, covering areas such as Inclusive Business development and innovation, to enhance and efficiently achieve the targets of each Inclusive Business initiative. In addition IAP will select and train a number of local consultants that will be available to support the businesses on a fee for services basis. IAP secures a transparent evaluation and selection process by working with a multi-player independent appraisal process, so that no single person can influence the process and/or the final outcome in any way. Applicants can contact directly the IAP Executive Manager at jayala@snv.org to denounce any corruption practice or case. 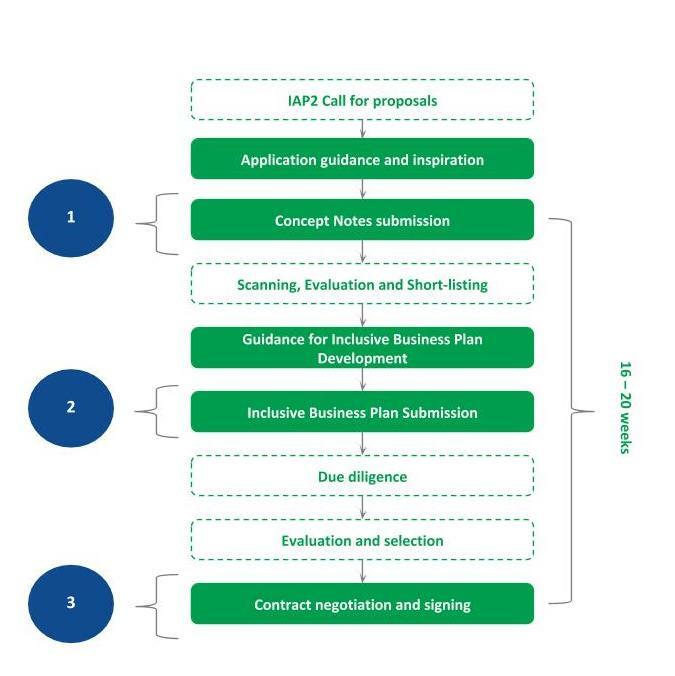 The IAP application process is organized around two phases: the submission of a concept note and if shortlisted the submission of a full business plan. Each concept note will be reviewed to ensure that it complies with the minimum eligibility criteria and will then be evaluated against the basic assessment criteria, including: project viability, social impact, innovation, the responsible business approach, and sustainability and scale-up potential. Shortlisted candidates will subsequently be invited to submit a full business plan, which will be evaluated against the full list of assessment criteria, which includes in addition to the basic assessment criteria: additionality, cost effectiveness and other risk factors. It is important to note that the selection process is implemented on a first come, first serve basis. Before filling out the application form, make sure to read carefully the guidelines that explain in detail the all the aspects of the application process and the selection criteria. In case you have additional queries which are not covered in the guidelines, please refer to the Frequently Asked Questions. If your question remains unanswered feel free to contact us. From the IBA blog: Innovations Against Poverty – what is it all about? From the IBA blog: The Innovations Against Poverty Fund has launched! Download the IAP leaflet here. Download the application form in Word format here. NOTE: only applications submitted online will be considered, this file is for preparation purposes only. Do you want to scale your business in low-income markets? Do you want to improve your competencies in practical and applicable way? Are you looking for the latest insight on company practices in low-income markets? IAP and IBA are continuously training advisors and consultants to expand the pool of quality business experts. If you require advisory support, you can find a large pool of specialists on our advisory marketplace: https://iba.ventures/advisory/. Meet the companies part of the Innovations Against Poverty portfolio below! Across emerging markets we can find a great number of business models engaging with smallholder farmers as co-owners and partners in the value chain1, ..
Having grown up in one of Kampala’s slums, experiencing for himself problems of poor sanitation, young and innovative Samuel Malinga started to develop an ..